Macuria studied at the Dwight School in Englewood, New Jersey in 1963 under Ms. Rose Alber a graduate of the Stuttgart Academy. In the mid to late 1960's Macuria did her upper graduate studies in New York City at Columbia University. The artist then moved to Philadelphia to finish her studies at the University of Pennsylvania, Bryn Mawr College and the Pennsylvania Academy of Fine Arts under Pittman, Stumpfig and Kamaherra. 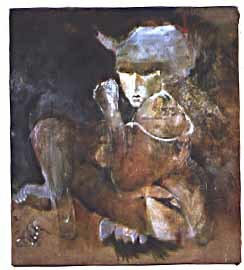 During the 1970's while living and working in New York Macuria established herself as a professional artist in SoHo. During the summers she traveled throughout Europe and the Mediterranean, expanding her knowledge of classical forms and design. While in Europe she became involved with theater and the film festivals in Cannes and Athens designing backdrops and stage sets. The 1980's and early 90's were very productive years for Macuria. She became involved in Art and Public Relations for Independent Foreign Motion Picture Films in New York and Los Angles as well as the Office of Cultural and Historic Affairs in Hackensack, New Jersey. Macuria has exhibited her work internationally with special attention to New York City at Kamikaze, the Mudd Club and East of Eden. She has also exhibited in Paris and at Electra in Athens. 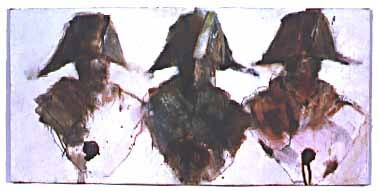 Macuria has a remarkable portfolio and professional reputation and continues to exhibit her paintings worldwide in many prominent private and public collections. She maintains studios in Vermont and Wilton Manors where she has ongoing exhibitions at Murc Studios. 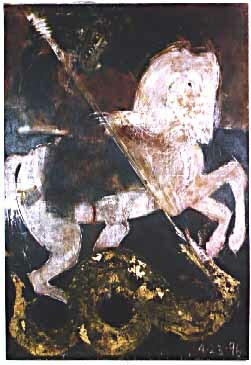 "Saint George and the Serpent"